Research without call to action may be interesting, but in the end, not very useful. This is particularly true with customer experience research. It is incumbent on customer experience researchers to give management research tools which will identify clear call to action items –items in which investments will yield the highest return on investment (ROI) in terms of meeting management’s customer experience objectives. This post introduces a simple intuitive mystery shopping analysis technique that identifies the service behaviors with the highest potential for ROI in terms of achieving these objectives. Mystery shopping gap analysis is a simple three-step analytical technique. Let’s assume the key objective is increased purchase intent. At the conclusion of the customer experience you want the customer to have increased purchase intent. Next draft a research question to serve as a dependent variable measuring the customer’s purchase intent. Dependent variables are those which are influenced or dependent on the behaviors measured in the mystery shop. After fielding the mystery shop study, and collecting a statistically significant number of shops, the next step is to determine the strength of the relationship between this key customer experience measure (the dependent variable) and each behavior or service attribute measured (independent variable). There are a number of ways to determine the strength of the relationship, perhaps the easiest is a simple cross-tabulation of the results. Cross tabulation groups all the shops with positive purchase intent and all the shops with negative purchase intent together and makes comparisons between the two groups. The greater the difference in the frequency of a given behavior or service attribute between shops with positive purchase intent compared to negative, the stronger the relationship to purchase intent. The result of this cross-tabulation yields a measure of the importance of each behavior or service attribute. Those with stronger relationships to purchase intent are deemed more important than those with weaker relationships to purchase intent. The third and final step in this analysis to plot the importance of each behavior relative to the performance of each behavior together on a 2-dimensional quadrant chart, where one axis is the importance of the behavior and the other is its performance or the frequency with which it is observed. 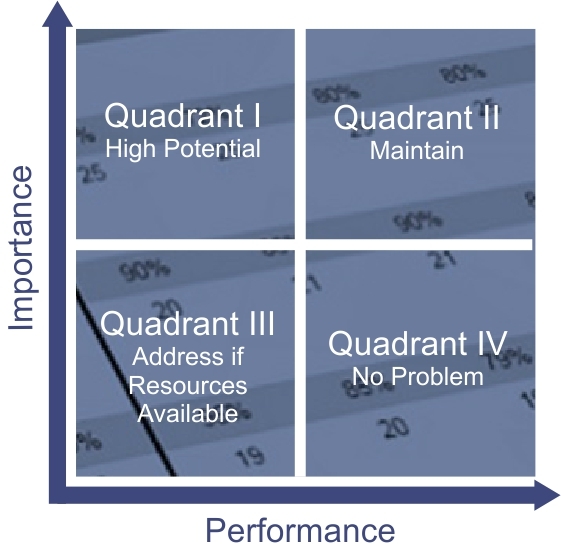 Interpreting the results of this quadrant analysis is fairly simple. Behaviors with above average importance and below average performance are the “high potential” behaviors. These are the behaviors with the highest potential for return on investment (ROI) in terms of driving purchase intent. These are the behaviors to prioritize investments in training, incentives and rewards. These are the behaviors which will yield the highest ROI. Those with the high importance and high performance are the next priority. They are the behaviors to maintain. They are important and employees perform them frequently, so invest to maintain their performance. Those with low importance are low performance are areas to address if resources are available. Finally, behaviors or service attributes with low importance yet high performance are in no need of investment. They are performed with a high degree of frequency, but not very important, and will not yield an ROI in terms of driving purchase intent. This simple, intuitive gap analysis technique will provide a clear call to action in terms of identifying service behaviors and attributes which will yield the most ROI in terms of achieving your key objective of the customer experience. Most mystery shopping programs score shops according to some scoring methodology to distill the mystery shop results down into a single number. Scoring methodologies vary, but the most common methodology is to assign points earned for each behavior measured and divide the total points earned by the total points possible, yielding a percentage of points earned relative to points possible. Some behaviors are more important than others. As a result, best in class mystery shop programs weight behaviors by assigning more points possible to those deemed more important. Best practices in mystery shop weighting begin by assigning weights according to management standards (behaviors deemed more important, such as certain sales or customer education behaviors), or according to their importance to their relationship to a desired outcome such as purchase intent or loyalty. Service behaviors with stronger relationships to the desired outcome receive stronger weight. One tool to identify behavioral relationships to desired outcomes is Key Driver Analysis. See the attached post for a discussion of Key Driver Analysis. It is a best practice in mystery shopping to calculate the score for each business unit independently (employee, store, region, division, corporate), rather than averaging business unit scores together (such as calculating a region’s score by averaging the individual stores or even shop scores for the region). Averaging averages will only yield a mathematically correct score if all shops have exactly the same points possible, and if all business units have exactly the same number of shops. However, if the shop has any skip logic, where some questions are only answered if specific conditions exist, different shops will have different points possible, and it is a mistake to average them together. Averaging them together gives shops with skipped questions disproportionate weight. Rather, points earned should be divided by points possible for each business unit independently. 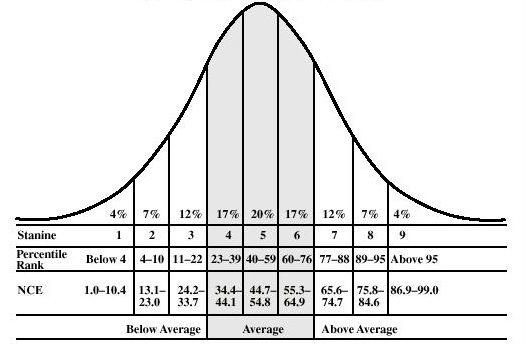 Just remember – don’t average averages! When all is said and done, the product of a best in class mystery shop scoring methodology will produce a distribution of shop scores, particularly on the low end of the distribution. Mystery shop programs with tight distributions around the average shop score offer little opportunity to identify areas for improvement. All the shops end up being very similar to each other, making it difficult to identify problem areas and improve employee behaviors. Distributions with scores skewed to the low end, make it much easier to identify poor shops and offer opportunities for improvement via employee coaching. If questionnaire design and scoring create scores with tight distributions, consider a redesign. Most mystery shopping programs score shops according to some scoring methodology. In designing a mystery shop score methodology best in class programs focus on driving desired behaviors, do not average averages and work toward a distribution of shops. Best in class mystery shop programs provide managers a means of applying coaching, training, incentives, and other motivational tools directly on the sales and service behaviors that matter most in terms of driving the desired customer experience outcome. One tool to identify which sales and service behaviors are most important is Key Driver Analysis. Key Driver Analysis determines the relationship between specific behaviors and a desired outcome. For most brands and industries, the desired outcomes are purchase intent or return intent (customer loyalty). This analytical tool helps mangers identify and reinforce sales and service behaviors which drive sales or loyalty – behaviors that matter. As with all research, it is a best practice to anticipate the analysis when designing a mystery shop program. In anticipating the analytical needs of Key Driver Analysis identify what specific desired outcome you want from the customer as a result of the experience. Do you want the customer to purchase something? Do you want them return for another purchase? The answer to these questions will anticipate the analysis and build in mechanisms for Key Driver Analysis to identify which behaviors are more important in driving this desired outcome – which behaviors matter most. Next, ask shoppers if they had been an actual customer, how the experience influenced their return intent. Group shops by positive and negative return intent to identify how mystery shops with positive return intent differ from those with negative. This yields a ranking of the importance of each behavior by the strength of its relationship to return intent. Additionally, pair the return intent rating with a follow-up question asking, why the shopper rated their return intent as they did. The responses to this question should be grouped and classified into similar themes, and grouped by the return intent rating described above. The result of this analysis produces a qualitative determination of what sales and service practices drive return intent. Finally, Key Driver Analysis produces a means to identify which behaviors have the highest potential for return on investment in terms of driving return intent. This is achieved by comparing the importance of each behavior (as defined above) and its performance (the frequency in which it is observed). 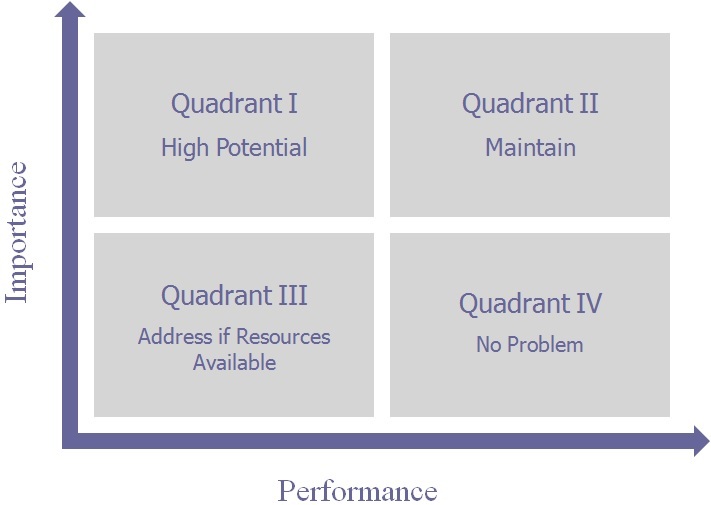 Mapping this comparison in a quadrant chart, provides a means for identifying behaviors with relatively high importance and low performance – behaviors which will yield the highest potential for return on investment in terms of driving return intent. Behaviors with the highest potential for return on investment can then be inserted into a feedback loop into the mystery shop scoring methodology by informing decisions with respect to weighting specific mystery shop questions, assigning more weight to behaviors with the highest potential for return on investment. Employing Key Driver Analysis gives managers a means of focusing training, coaching, incentives, and other motivational tools directly on the sales and service behaviors that will produce the largest return on investment. See the attached post for further discussion of mystery shop scoring. Previously we examined best practices in taking action on mystery shop results. When mystery shopping initiatives fail to meet their potential, it is often because the people who are accountable for the results — front-line employees, supervisors, store managers, and regional managers — were never properly introduced to the program. As a result, there may be internal resistance, creating an unnecessary distraction from the achievement of the company’s service improvement goals. A mystery shopping best practice is to ensure employees throughout the organization are fully informed and have bought into the mystery shopping program before it is launched. Pre-launch efforts should include: the specific behaviors expected of customer facing employees, a copy of the mystery shop questionnaire, training on how to read mystery shopping reports, how to use the information effectively, and how to set goals for improvement. A best practice in mystery shop program design is to anticipate the amount of administration necessary to run a successful mystery shopping program. It requires a strong administrator to keep the company focused and engaged, and to make sure that recalcitrant field managers are not able to undermine the program before it stabilizes and begins to realize its potential value. Disputed shops are part of the process. Mystery shops are just a snap shot in time, measuring complex service interactions. As a result, there may be extenuating circumstances that need to be addressed, or questions about the quality of the mystery shopper’s performance that require both a fair and firm process to dispute shop scores. Fairness is critical to employee buy-in and morale. Firmness is required to keep the number of shop disputes in check, and cut down on frivolous score disputes. Click here for the final installment in this series.